תיבת תצוגה מעור מלאכותי למטבע - 8 מטבעות A beautiful steel case wrapped with black leatherette cover with white interior. 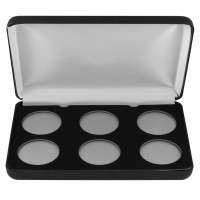 This case is suitable for six 1 oz silver coin capsules (38 mm, 39 mm, 40.6 mm coins - outside diameter of the coin capsules that will fit into this box is 44.45 mm). In order to place the coin capsules into the box, place the coin capsule bottom on a flat surface, remove the black insert card from the box, centre it over the coin capsule and firmly press the card onto the capsule. Keep your fingers close to the edge of the hole to prevent breaking the card. Keep pressing until the coin capsule bottom is even with the back side of the insert card.